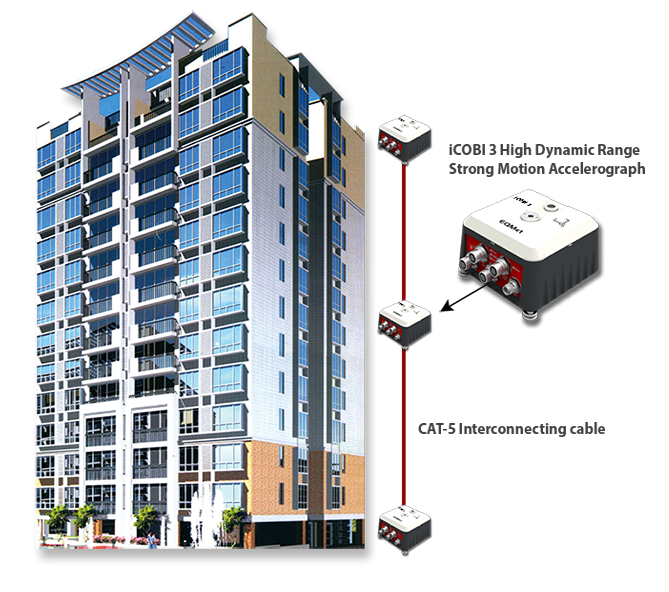 Internet ready, code Compliant Building Instrumentation (iCOBI) system for seismic monitoring, is part of EQMet line of products. Seismic monitoring systems provide valuable data and information on the behavior of buildings leading to improved understanding and better design codes. For these reasons, many municipalities (e.g., City of Los Angeles, CA USA) require seismic instrumentation or offer benefits such as reduced inspection time as part of a building occupancy resumption program (e.g., BORP San Francisco, CA USA). Compliant with Los Angeles Building Code. Remote alerting capability for system event or auto-diagnostic failure. System timing accuracy to 0.5 milliseconds due to synchronized sampling. Mean-Time-Between-Failures (MTBF) in excess of 500,000 hours. Cost-effective solution that satisfIES today’s most demanding seismic applications. The iCOBI 3 system includes digitizers, battery systems providing 48 hours of autonomy and communications equipment. Users only need to supply the CAT-5 interconnection cable and local AC power. Find out more about this product by downloading the Datasheet and Manual.